 To make the vinaigrette: In a medium bowl, whisk the shallots, lemon zest, lemon juice, capers, peperoncini, parsley, and vinegar together. Gradually whisk in the olive oil. Season to taste with salt and pepper. To cook the chicken: Heat a grill pan over medium- high heat. Coat the chicken with the olive oil and season with salt and pepper. Grill the chicken for about 4 minutes per side, or until it is seared with grill marks and shows no sign of pink when pierced in the thickest part with the tip of a small sharp knife. Transfer to a cutting board. To assemble the salad: In a large bowl, combine the arugula and tomatoes. Trim the ends of the zucchini. One at a time, lay the zucchini flat on a work surface and, using a vegetable peeler and working from the stem end to the blossom end, shave off long, thin ribbons until you reach the seedy center. Turn the zucchini around and repeat on second, then repeat on the third and fourth sides. Add the ribbons to the bowl and discard the seedy centers of the zucchini. Using your hands, to avoid breaking the ribbons, gently toss the salad with enough vinaigrette to coat. Season with salt and pepper. Cut each chicken breast half crosswise into thirds. 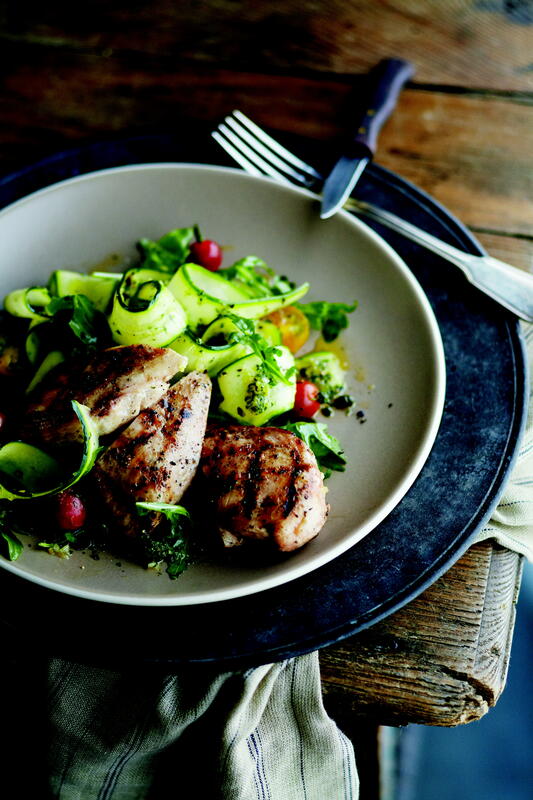 Transfer a cut chicken breast to each dinner plate and heap some of the salad alongside. Drizzle the chicken and salad with the remaining vinaigrette and serve immediately. Excerpted from Curtis Stone’s What’s For Dinner. Copyright © 2013 by Random House, Inc. Published by Ballantine Books. Reproduced by arrangement with the Publisher. All rights reserved.